I just bought a P-10C ORS. I am thinking of shooting it for everything. As the saying goes, "Beware the man with one gun..." I've picked up 3 different kinds of magazines. For most concealed carry, I'll use the 15 round flush fit. For a back up carry magazine, IDPA and Steel Challenge competition I'll use those mags with a +2 base pad. 2 more rounds and a little more grip is a good thing. For USPSA carry optics, it's harder. As I understand it, unlike Glocks, CZ's have an over insertion problem. I have found a 21 round magazine that works fine for the P-10C. But it can be over inserted. See the picture. Does anyone make a spacer or does someone like CGW or CZC want to make a spacer to fill the gap like the spacer S&W makes to use with a 17 round magazine on a compact gun? With a CZC 10 coil spring and thin follower, the long mag holds 22 rounds. That's good enough for me to use in USPSA Carry Optics. BTW, the TLR-8 is really cool. Hiya Smitty79 and thx for your thread. 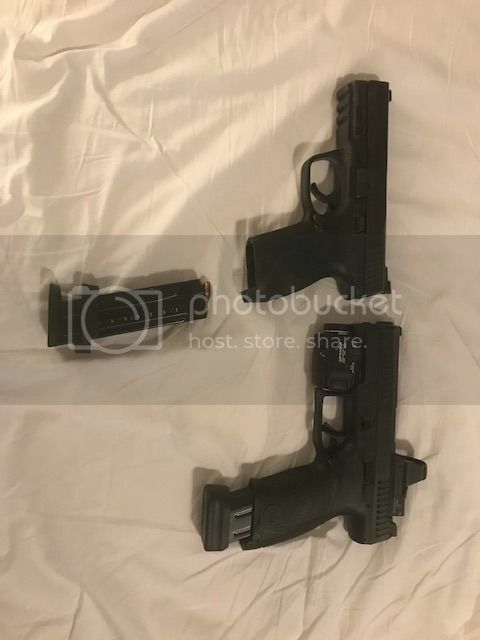 I've gotten so used to how my 26rd mags for the shadow and tactical sports ,and bedside p-01 look,wasnt on my radar till your pic makes it looks a little awkward. With my TS and CM mags selling for 130bucks from cz, would not wanna encourage anything that could lead to a 170 mag,and it don't even have a rubber/poly base. Let it grow on ya and soon like me ya won't even notice it. Otherwise pop into Greg Cotes website and you may find what you seek. Be well. I don't think a sleeve like this currently exists for sale anywhere, for the P-10 or P-07 / P-09 series. Another poster here created a thread asking who was interested in such a thing recently... he was thinking of 3D printing some and putting them up for sale. I've probably spent $1000 at Greg Cote. He doesnt have a spacer. I am not into 3D printing. But this sounds like a great project for anyone who is. Cz custom has a bottom plate that allows you to use a p09 mag with the p10 compact. Allows a couple more rounds in there as well. Thanks. I need to get one of those. Right now, with the base pad that came with the mag and a CZC 10 coil spring, I get 22 rounds in the mag. That base pad says it's +1, which limits me to 21. I may see what I can do with Kydex. I trimmed down the legs on the bottom of my followers and it allows 1 more round in the mag. Did it to all my +2 extension mags as 3 extra rounds for $5 is better than 5 rounds for $30+ with the aluminum extensions.